SINGAPORE (Reuters) – The Australian dollar remained near a two-week low on Thursday, as investors wagered that interest rates would most likely be cut this year due to mounting growth risks at home and abroad. 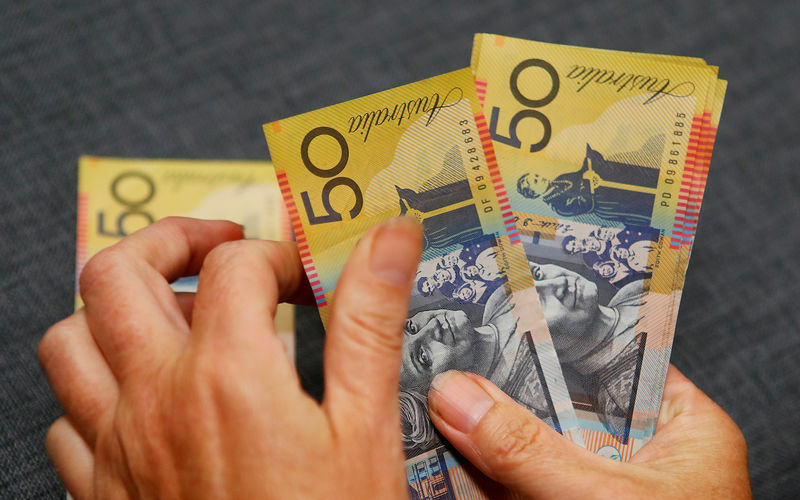 Australia&apos;s central bank on Wednesday opened the door to a possible rate cut as it acknowledged growing economic risks in a remarkable shift from its long-standing tightening bias that sent the local dollar sliding. “We have a clear trading range for the Aussie dollar. The shift in the RBA&apos;s stance will likely make the Aussie test the $0.70 level versus the dollar,” added Michael McCarthy, chief markets strategist at CMC Markets. The New Zealand dollar was flat at $0.6765, after falling 0.1 percent earlier in the session after weaker-than-expected unemployment data on Thursday. On Wednesday, the kiwi tracked the Aussie dollar&apos;s fall, losing 1.72 percent, its steepest percentage decline since Aug. 9, 2018. “The BoE won&apos;t even consider changing interest rates until the terms to leaving the EU become clear,” said Kathy Lien, managing director of currency strategy at BK Asset Management.